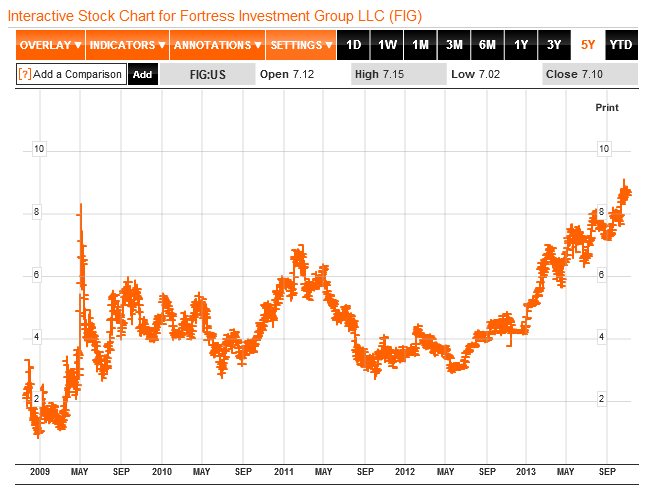 When I posted my first writeup on Fortress Investment Group (FIG:US), it was May-2012 & the share price was only $3.11. Buying the shares (& writing about them), I felt like I was in the thick of battle – trying to defend a breached portcullis in a last-ditch & perhaps doomed effort! [In hindsight, the more revulsion I hear about a post/company, the more promising the investment opportunity might actually be…] But the situation certainly looked much safer by December (with the share price at $4.38), when I posted a follow-up piece: Another Assault on Fortress. And now here we are, standing proud & tall on the ramparts, masters of all before us – the share price is $8.17, and even traded up to $9.00+ recently! But ramparts aren’t about the view, they’re designed for spotting danger. My last fair value price target was $8.84 per share – we need to do a fresh survey. How much upside potential is now on offer? And more importantly, has our margin of safety been eroded to unacceptable levels?